In this second post Lou McGill focusses on the DLM project which produced a dynamic map of the entire Medical Curriculum at Newcastle University. 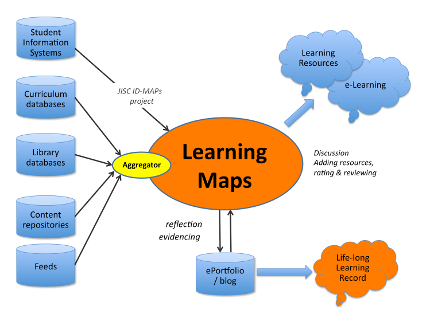 The Dynamic Learning Maps (DLM) project at Newcastle University was funded by JISC as part of the Transforming Curriculum Delivery Through Technology programme. This programme saw a very diverse set of projects use technology to address a number of institutional challenges and ultimately transform their approaches to enhancing the student experience. The DLM project aimed to make visible the complex medical ‘spiral curriculum’ where topics are revisited with increasing depth over a 5 year programme, and to reveal connections across curricula to support modular learning. High level goals included a desire to promote lifelong learning, enhance employability and enable personalisation for students. The diverse nature of stakeholders with unique views of the curricula increased the complexity of the project and led to some interesting paths and choices as the team developed the maps. Simply getting agreement on what constitutes a curriculum map proved challenging and required a highly flexible approach and agile development. Like many technical development projects DLM had to balance the need to develop a common understanding with the need to reflect different stakeholder requirements. Agreeing on what elements to include and the level of detail was important as well as the fundamental issues around how they might be used by both staff and students. The project stands out in this programme for a few reasons – not least that it has much in common with the ongoing Institutional Approaches to Curriculum Design programme, which has several projects engaged with mapping the curriculum. DLM has developed an interesting mix of formal curriculum maps, personal learning records and community-driven maps which have proved to be as useful for curriculum teams as for the medical, psychology and speech and language students they support. Another distinguishing feature of the project was that it had a more technical focus than other projects – engaging with neural networks, a range of institutional systems, data feeds and mashups, e-portfolios as well as a range of web 2.0 approaches. Curriculum maps are diagrammatic representations of the curriculum and can be seen as operational tools for staff to support course management and administration or as aids to support curriculum design and delivery. They offer a window on to the curriculum and can include learning outcomes, content, assessment and information about people. They can be complex and are usually very labour intensive to develop and embed into institutional processes. Making curriculum maps open to students gives them navigational aids through their courses, providing clarity around different modules, identifying connections between these and supporting module choices. Adding capacity to personalise their pathways through the maps, link to individual portfolios records and add their own resources to can turn curriculum maps into powerful learning aids. This is what makes the DLM project stand out for me. It is challenging enough to visually represent or describe a curriculum, but using established standards and technologies to link data in a meaningful way takes things to another level as connections can be made with a range of institutional systems. A separate tool was developed to manage programme-level learning outcomes and link these to units /modules, this provides a feed used in Learning Maps. This was necessary because existing data from an MBBS study guides database was in non-standardised text; this tool enables curriculum managers to map specific programme-level outcomes, but to still use context-specific language of the module. Technically DLM is very interesting – the team built on previous work around personalisation and Web 2.0 approaches. The DLM concept was inspired by neural networks, where nodes can be connected to any other node in the network, and those connections vary in strength. They used open standards and existing corporate and programme data to support sustainability, transferability and reduce dependencies on specific systems. The project team took good advantage of work being done within the institution as part of other initiatives. The e-portfolio element of DLM drew on work done with the Leap2A specification for e-portfolio portability and interoperability as Newcastle University has been involved in developing the specification and the JISC EPICS-2 project (e-Portfolios and PDP in the North East). Taking a web service approach, when learners add their reflections and notes to curriculum topics these generate an xml file which is stored remotely in their individual portfolio using Leap2 and becomes part of their portable portfolio record. This approach means that even if departments have different e-portfolio systems the standardised data can be stored in any of them. For more information on Leap2A see the recent article by Christina Smart from JISC CETIS. DLM also benefitted from the experience of using XCRI-CAP from the mini project North East XCRI testbed (NEXT) which reported in April 2010. As an example of using XCRI feeds within a learning application, they added support for DLM. By embedding XCRI feeds inside learning maps course related information relating to specific parts of the curriculum are revealed using rss/atom feeds which send an http request to course database and http response into DLM. This experience was of significant value to both projects. Other initiatives built on by DLM were the use of CAS authentication as an outcome of the JISC Iamsect single-sign-on project and use of corporate data flows from the JISC ID-Maps project. Evaluation occurred throughout the process and early feedback shaped the visual representation and elements included in the maps. Students revealed an almost 50/50 split in preference for visual (concept map style) representation and hierarchical lists (text-based) so DLM has both styles of display, as well as tagcloud views. Ongoing challenges have emerged that are relevant to any curriculum mapping processes such as changing curricula – sometimes restructuring of whole courses, and the fact that the student journey through the curriculum changes over time. One particular issue is that each cohort has a different experience of the curriculum and the team were faced with a decision around mapping these differences, however they chose to opt only for the current map as this would link to up to date developments and guidelines which are crucial in the healthcare field. Other challenges include managing stepped/timed availability of resources, and that not all data is available in a usable or consistent form. A major challenge lies in balancing automated data with that requiring moderation or contextual information – impacting on choices around granularity of content and specificity. DLM offers different things to a range of stakeholders. For learners it offers an overview of their learning – a reminder of prior learning, a view of current learning and opportunities to consider future learning choices. They offer interactive opportunities for sharing, rating and reviewing resources as well as facilities to add personal reflective notes, portfolio records and evidencing learning outcomes. Different student groups expressed alternate ways of using DLM – ie for revision, contextualisation, planning curriculum choices or career choices. .
For staff DLM offers mechanisms to review curricula and identify connections across modules. In addition they highlight gaps in provision, duplication and issues around consistency of terminology. Staff are able to see how a student may perceive and engage with their curriculum, monitor access and equality of learning opportunities, and consider alignment of teaching learning and assessment. They will be able to identify which resources emerge as popular and offer a glimpse into learning that may happen outside the formal curriculum. At Newcastle, thanks to interest at strategic level the team are planning to extend DLM to geography and dentistry. It will be very interesting to see how well it transfers to other subject areas but there are quite a few challenges in transferring the model to other institutions, although the team have received expressions of interest. The extent of customisation required to make this work takes commitment and considerable technical support. A public demonstrator and software download is available via the project Website and thanks to the use of open standards other institutions could potentially take this forward if they too are prepared to develop a shared understanding of curriculum mapping and take the time to share data across their systems. This excerpt from the project final report nicely sums up the potential of DLM – it is definitely a report worth reading and I hope other institutions consider a similar model or take some of the steps towards making it work within their own context. This entry was posted in curriculum design, standards, Uncategorized and tagged curriculum delivery. Bookmark the permalink. 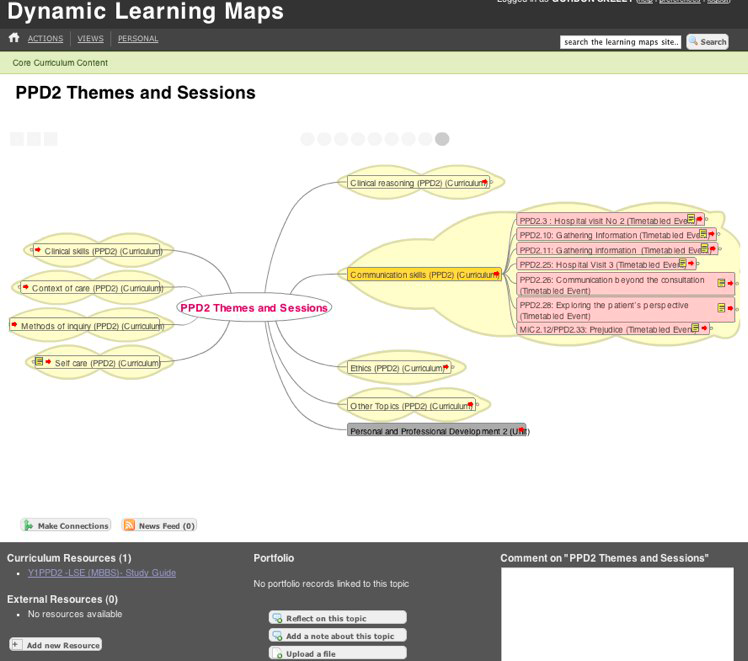 Thanks very much for your extensive blog post about Dynamic Learning Maps – it has certainly been a really rewarding project to be involved in. Things are going well since the JISC project completed; DLM has become deeply embedded in our Medical programme at Newcastle and we are now working with the first of a number of partner institutions which have expressed interest in using DLMs. Our project with Geography is also going well, where the focus is on mapping curricula to specialties and career paths with the aim of helping students make better informed module choices.